The Scheduler module helps you to schedule one-on-one appointments with your students. You can specify the periods during which you are available to see the students and the length of each appointment. The students then book themselves into one of the available timeslots. 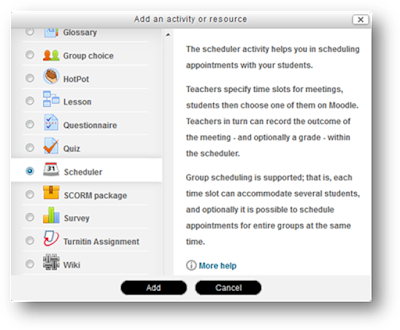 The module also lets the teacher to record the student's attendance, add notes and grade the appointment. 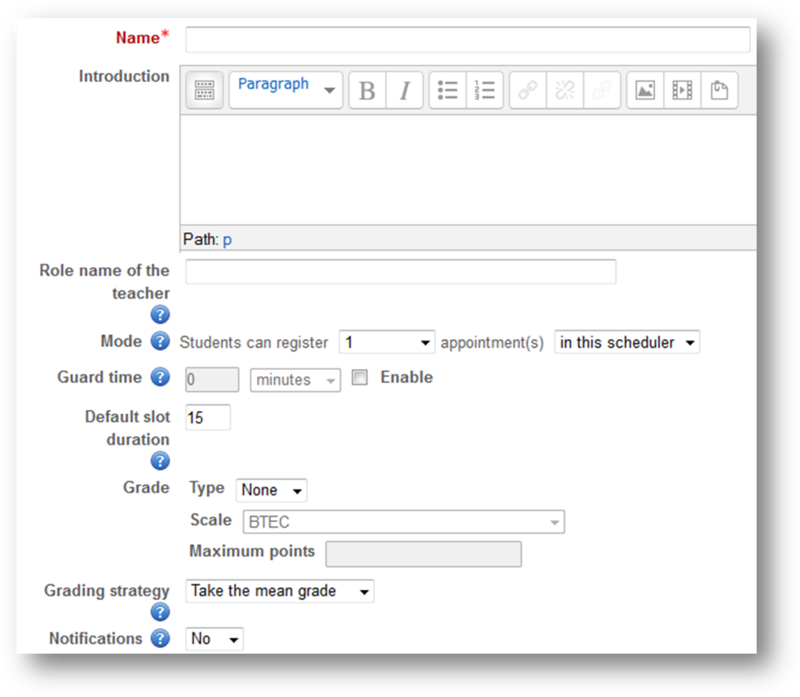 1.2 Decide where on the course page you would like to display the link to your scheduler. 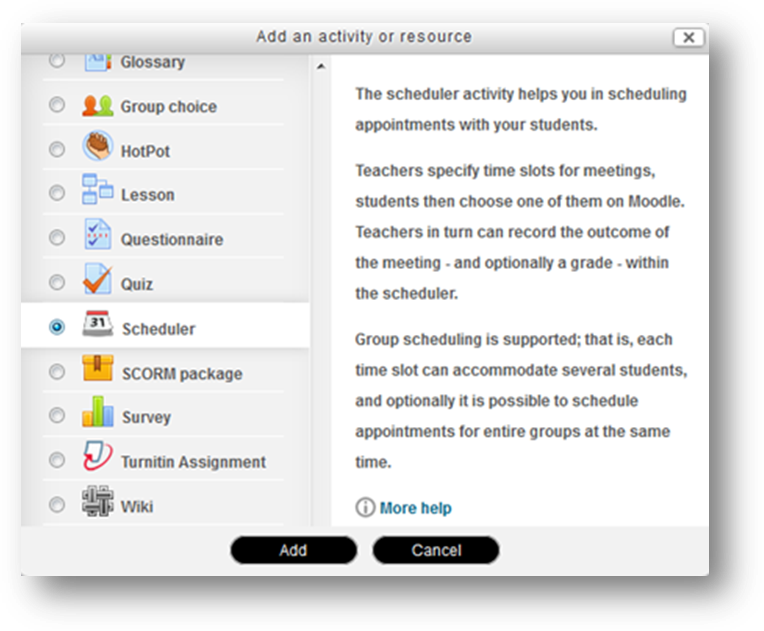 Click on the Add an activity or resource, then select Scheduler, then click on Add. Introduction – insert a description of your appointment. Role name of the teacher - The role of the person who will attend to the students. 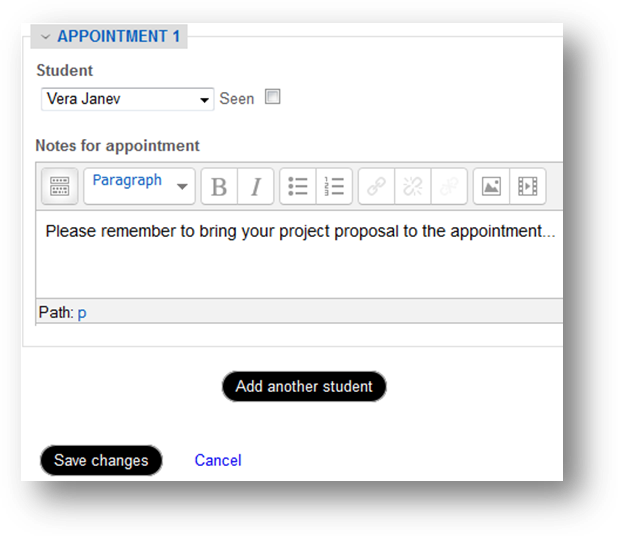 · in this scheduler - students can only book a fixed number of appointments in this activity. Students are not allowed to book further meetings once they have attended an appointment. 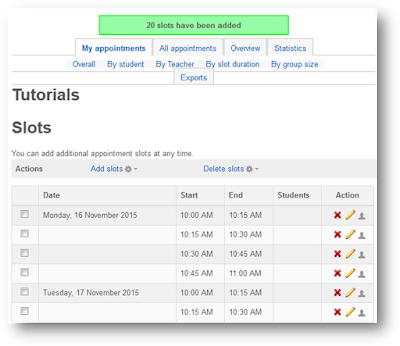 · at a time - students can book a fixed number of appointments. 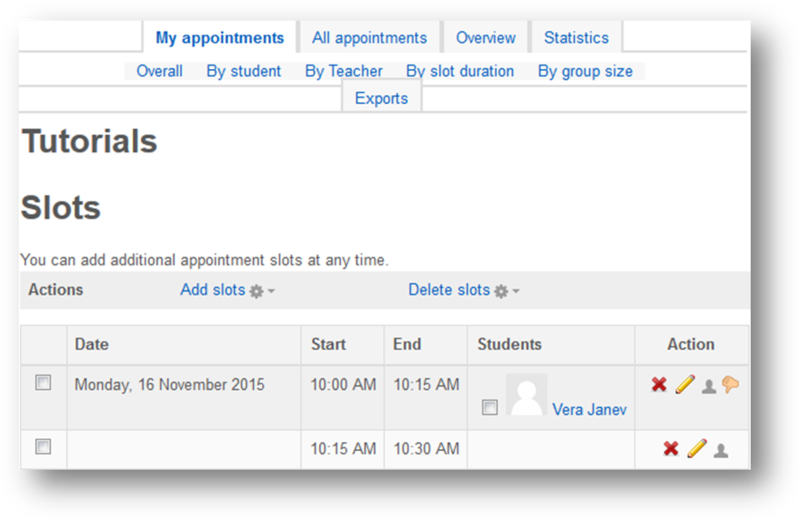 After attending an appointment students can book further appointments. Guard time - A guard time prevents students from changing their booking shortly before the appointment. Default slot duration – length in minutes for each appointment slot. 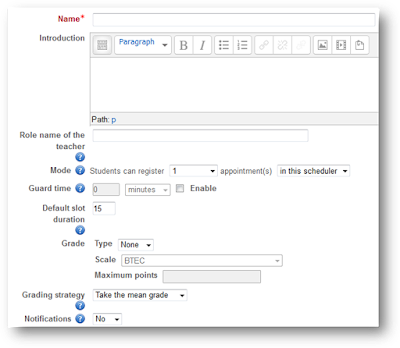 Grade / Grading strategy – set a grading type and how grades are aggregated if you intend to mark appointment. Notifications - teachers and students will receive notifications when appointments are booked or cancelled. Once you have setup your schedule click on the Save and Return to Course button. Once the schedule activity has been created it will contain no appointment slots. Repeat time slot until – set an end date for your appointments. If your appointments are available for a single day then leave the option on default (Enable unchecked). 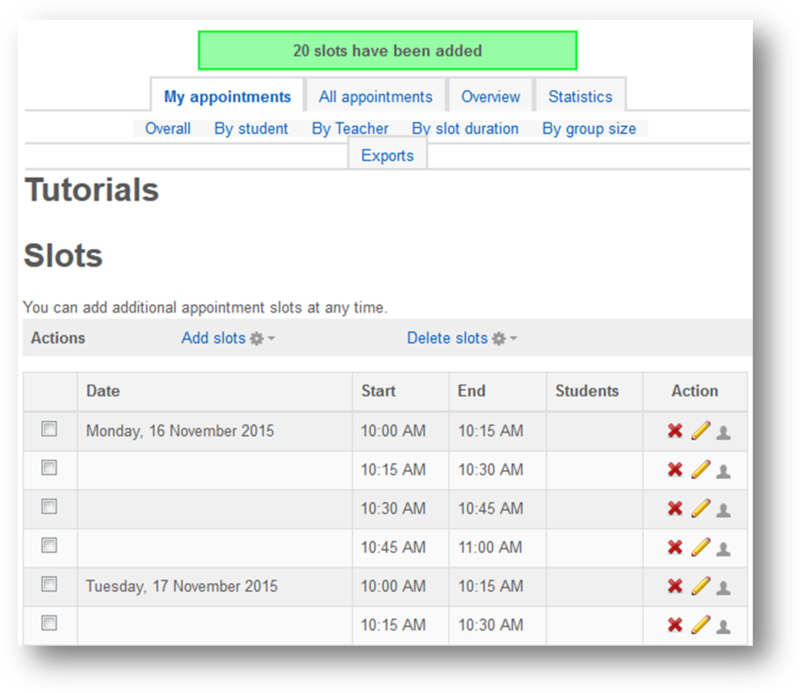 Add appointments on – if you have set Repeat time slot until then you will need to specify which days the appointments are available. Start Time / End Time – set the times at which the first and last appointments are available for booking. Divide into slots – ensure this setting is switched to Yes as it will divide the Start time and End time into appointments. Duration – specify the length of each appointment in minutes. Break in between slots – if you require breaks between each appointment enter in the number of minutes. Force when overlap – ensure this option is set to No so appointments do not clash. 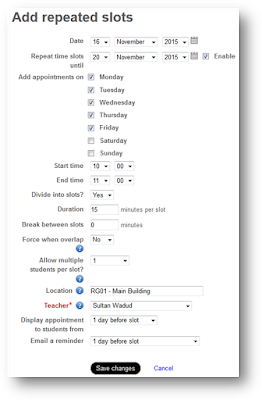 Allow multiple students per slot –if you wish to allow students to book more than one appointment change to the desired number otherwise the default is set to one appointment per students. Location – enter the location of where the appointment will be held. Teacher – select the teacher that the students are booking to see. 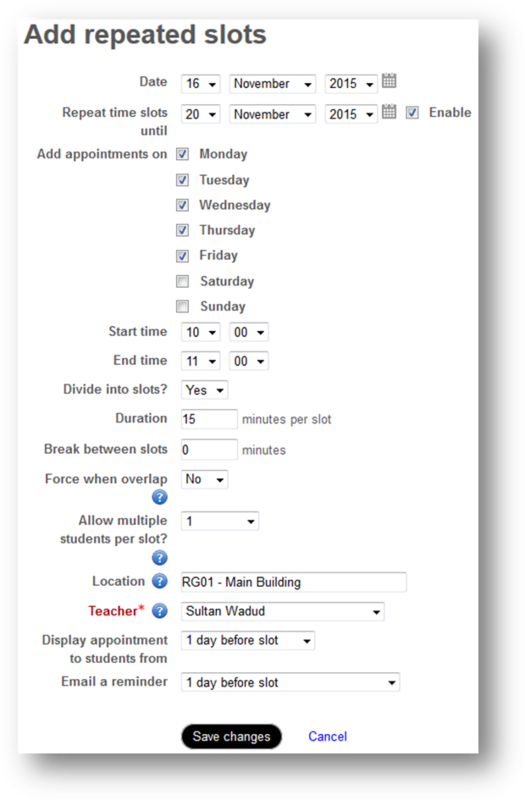 Display appointment to students from – determines when students can start making appointments from. Email a reminder – a useful option to automatically send a reminder about their appointment. 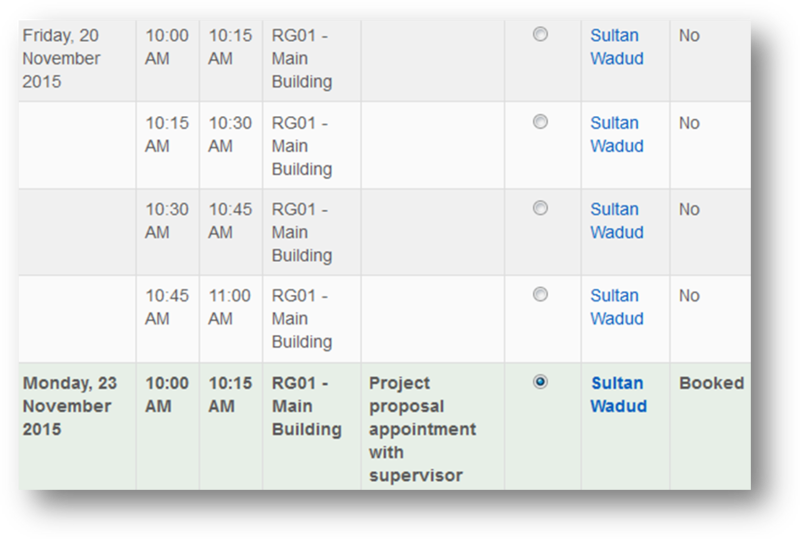 Refer to Add an appointment slot (above) and select Add single slot option. Date – the date when the appointment will take place. Ignore scheduling conflicts – leave this unchecked as it may lead to overlapping appointments for some teachers or students. Allow multiple students per slot – select how many students are allowed to sign up for the appointment. Teacher - select the teacher that the students are booking to see. Comments – you have the option to provide comments for the appointment. Click the Save changes buttons once you are done. 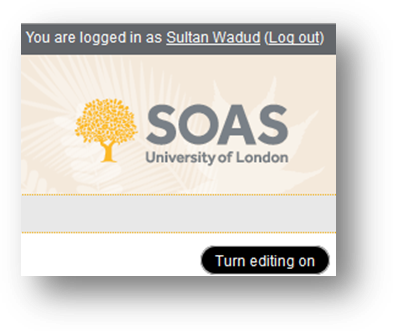 Delete - a slot and any students that have signed up for the appointment. 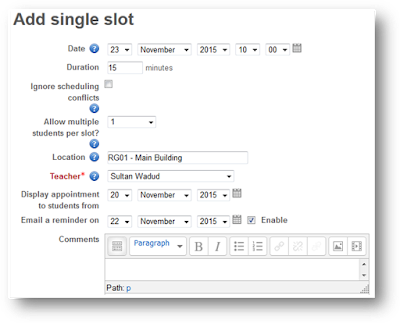 Change - amend details of the slot, such as start time, location etc as well as adding notes that you wish the student to be able to view. 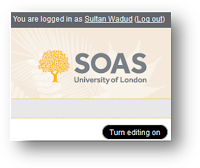 Exclusive slot – by default the slot is only available for one student. This can be changed so a group of students can book for an appointment. Revoke – allows you to remove a student from the slot and make it available for other students to book onto the slot. Please note this option will only appear once a student has booked for an appointment.